Do you need a fitness break? Taking regular fitness breaks during your day is healthy for your body and your mind. Commit to a goal of getting up, stretching or walking every 2 hours. Set your phone alarm to signal every 2 hours. Seated Hamstring Stretch: Sit forward in your chair. Extend your right leg straight out in front of you with your heel on the ground. Sit up tall and hold for 10-30 seconds, then release. Repeat with your left leg straight out in front of you. Reach up and Over Stretch: Reach both arms straight up overhead. Lean to your right, then your left. Walk the hallway. 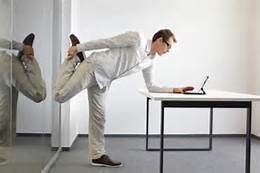 Get up and walk around your office, the hallway or around the building for ten minutes to increase circulation and decrease muscle tension. Stand up and breathe. Simply stand up to ease lower body tension, and perform 3-5 deep breaths.